I was given an assignment to complete by fellow blogging friend, and amazing educator, Dean Shareski. You can read his challenge post here. 1. I am a twin. I have a twin brother – and NO, we are not identical. You would not believe how many people have asked me that over the years. Seriously! 3. I’ve always wanted to go to New Zealand, but have no idea why. 4. I used to stuff donuts at Tim Horton’s when I was in Grade 12 – at the donut shop right near my high school, right after school, right when all my classmates would come for their after-school snack. Me in my hairnet and uniform. Can you say teenage nightmare? 5. I went to 6 elementary schools and 3 high schools. 7. I am highly determined and competitive – so much so that I gave birth to 2 out of 3 of my children without any pain medication (and long labours) because my husband said I couldn’t do it. Yep. 8. My first job, besides babysitting, was at Burger King – flipping burgers. 9. I’ve always wanted to learn to play a musical instrument and plan to take “band” with the Grade 7’s when I become a principal one day. 10. When I was 3 or 4, I stuck my arm up inside a gum ball machine, trying to get a gum ball. Well, my arm got stuck and the fire department had to be called to break the gumball machine and get my hand/arm out. Gumballs everywhere! 11. Chocolate is a good friend of mine. Very good friend. We’re BFF’s! There is not a day that doesn’t go by that we don’t spend some time together. How do you feel about pants? Hmmm…. pants…. I like to wear them, but don’t wear capris because I am too short and my husband makes fun of me when I wear them. 2. What was the last movie you saw in a theatre? I just saw Frozen with my kids. It was an awesome movie. I recommend it to everyone! You can watch a trailer here. “For the first time in forever, nothing is in my way!” Great message! My favourite character is the snowman Olof. 3. Where are your car keys? On the banister in the hallway by the door. I always put them in the same spot. Started the post at 8:20pm – Kids had just gone to sleep. It is now 9:45pm! 5. What’s the last tweet you favourited? 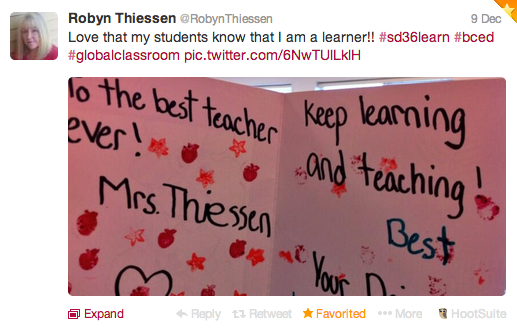 My last tweet I favourited was from a friend of mine, Robyn Thiessen. She is a great model of life-long learning for everyone, including her students! I love learning from and with her! 6. Outside of your immediate family, which relative do you like to spend time with? Hmmmmm… can I say my sister-in-law? I love spending time with her. She is fun to be around and loves my kids. 7. Have you ever been to Saskatchewan? Nope. I don’t really see that happening in my future. Hmmmm… not unless the next DENSI happens to be there! 8. How long did it take you to walk to school as a kid? It depends which home you are referring. When I was in Grade 2 though, we lived fairly close to our school. It would take us probably 10 minutes to walk there from the trailer park. However, we liked to stop and feed the horse in the field next to the sidewalk we took to school. So, we would often take a lot longer to walk to school, with our recess apple missing when we finally did make it to school. 9. Besides you, blogger should I be paying attention to? I hate to admit it, but, sadly, I haven’t been reading many blogs lately. I always enjoy reading the thoughts of Chris Wejr and Chris Kennedy. Shawn Davids is a principal in Langley and a new blogger who has a lot to add to the education conversation. 10. Name one golf course. I can name many. My favourite ones to eat at are Northview and Eaglequest and my favourite one to play at is Stanley Park Pitch and Putt. Unfortunately, I haven’t golfed since before I had my first child almost 9 years ago! 11. What’s your favorite Seinfeld episode or line? Come have some fun and accept this challenge invitation to allow others to get to know you a bit better. 11c. YOU … Yah, that means YOU! You read this, you are challenged invited to allow us the opportunity to get to know you a bit more by participating in this game of blogging tag. 1. What are your favourite and least favourite colours? 2. What was your favourite subject / least favourite subject in school? 4. What was your lowest grade in your post-secondary classes? In what class? 5. What is the best characteristic you received from your mom? 6. What is your favourite childhood memory? 7. How old were you when you learned to swim? 8. Is Disneyland really the Happiest Place on Earth? 9. What’s your favourite video you’ve watched recently on social media? 10. If you could plan it, what would your last meal consist of? 11. What makes you happiest? This entry was posted in Uncategorized and tagged blogger, challenge, friends, fun, invite, meme, personal, questions, shareski, tag. Bookmark the permalink. Nice, Antonio! I didn’t know you were a picky eater! Thanks for playing along! I did my homework at 2am last night. Reminds me of high school. And I know you would have a bird if I handed in something without self assessing. I couldn’t find the rubric, I probably lost it, so I give myself a C+. (translation= meh) Here’s the link: http://teacherdiana.com/more-homework/ I don’t know how to do a ping back or even what that is. I think I may need an IEP. Thanks for this-it was fun. Except Dean won’t be my friend anymore because I hate Seinfeld. Can you call his parents? C+ – really? It’s awesome! I would never tie your wonderful reflection and information to a grade though – no grade is high enough for sharing who you are as a person! I’m sure Dean will still be your friend, even though you don’t like Seinfeld. It was such a funny show – surprised that you hate it – strong words! Thanks for sharing more of you with the world! Glad I could help push you a bit to post on your blog. Now, just waiting for the many posts awaiting in your draft folder! Thanks for doing your homework. I always love learning more about you. I love the vision of you out for dinner and dessert with just you and your mom and dad. How sweet that must have been. I’m sure you have many wonderful memories of this special time together. Hi Tia! I’ve linked to this post and mentioned you in my own because you’re such an amazing educator and someone I value having in my PLN. I didn’t pass along any more homework though, just the link! Happy New Year! Great post..Thanks for sharing this.